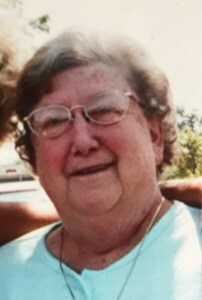 Evelyn "Pat" Raible, 84, of Louisville, Kentucky, passed away on Thursday, April 11, 2019. She was born on September 29, 1934 in Louisville, Kentucky to the late William and Anna (Dodge) Raible. She is also preceded in death by her brother John J. Raible and sister Anna Marie Cummins Keiran. Pat attended Mercy High School and retired from American National Insurance Company. She is survived by her niece Patricia Paticchio, cousin Linda Spaulding (Gene) and Bobbie Merket her devoted friend and caregiver. Visitation will be from 9:00 am until the time of Mass at 10:00 am on Wednesday, April 17, 2019 at St. Therese of Lisieux Catholic Church (1010 Schiller Avenue Louisville, KY 40204) with burial to follow at St. Michael's Cemetery. The family requests that contributions in Pat’s memory be made to St. Therese of Lisieux Catholic Church (1010 Schiller Avenue Louisville, KY 40204). Add your memories to the guest book of Evelyn Raible. She has left me with wonderful memories! Pat will live on in my heart ALWAYS!